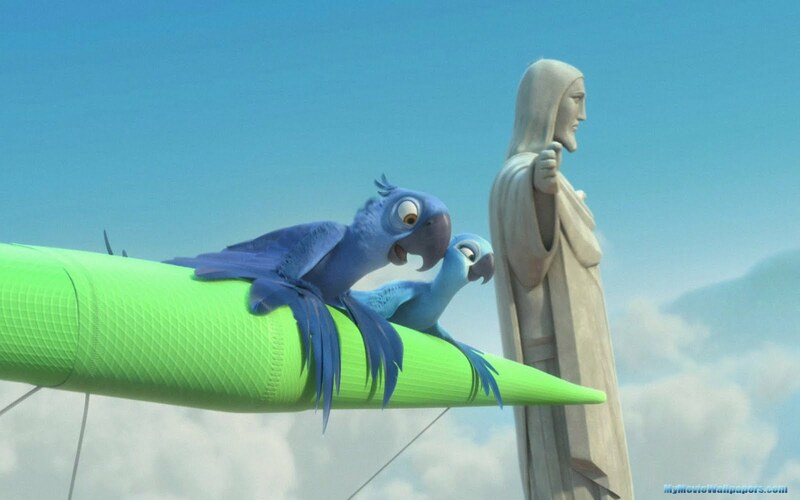 Rio is a visual feast with a story that appeals to those who haven’t seen it before. There is a delightful opening scene at the beginning of Rio which is ended promptly by poachers catching birds in myriad ways. Only in cartoons can evil work so efficiently. Always where they need to be and when they need to be there to keep the protagonists in peril. This is the engine with which Rio is transported from place to place. It’s a bit like having the car always running in the driveway. Even though you are out of it, it could take off on you at any time. Jessie Eisenberg plays Blu, a Blue Macaw that snatched as a baby, ending up in Minnesota in the care of little Linda (Leslie Mann), who grows up with Blu in to the owner of a book store. 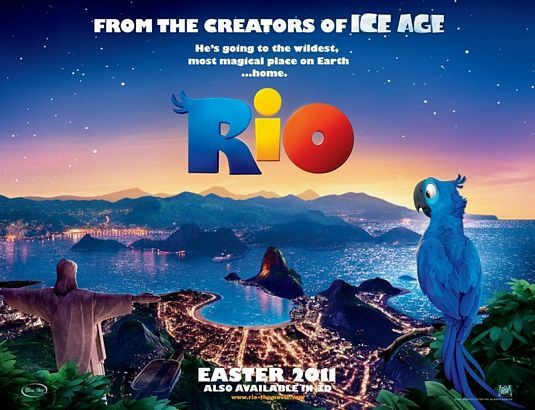 Turns out Blu is the last male of his kind, and the last female is waiting for him in, you guessed it, Rio De Janeiro. Linda agrees to take Blu to Rio and there, with the help of Túlio Monteiro (Santoro), give the breed a kick start with prospective mate Jewel (Hathaway). The first night they are together they are, of course, kidnapped. One iconic shot that I am glad they were brave enough to include. are cute, adorable and distinctively voiced. This is entertaining to watch, if not entirely memorable as the periferal characters of Madagascar. Eisenberg is a good choice to play a flightless bird, as he has many of the qualities of someone who would not do what comes natural to most of his kind. Hathaway provides a lithe quality as a bird that knows what it’s like to be free. There are musical numbers that highlight the vocal prowess of Hathaway, Foxx, will.i.am and Clement. These are notable primarily for their use of drums and the superb animation that accompanies them. Rio De Janeiro provides a wonderful palate of colors: each flight is a treasure. The movie is re-watchable more than most animated films like Rango if for no other reasons than the animation is so much more colorful, it brings a smile to your face. There are some funny moments, but the appeal is more to the kids than adults. Will this film stand the test of time? My kids really love it, have sung its songs for days and say the funny lines as they come up. In a few years, if they are still watching it, my guess is they will have a little harder time remembering anything besides the beauty. Next Post James Cameron’s Sanctum piles on the water, the accents, the cliches, etc.